Since Nigeria attained independence in October 1960, several elections have been held at different points in time, but none have passed the criteria for a credible, free and fair election. Since the enthronement of the All Progressives Congress, APC-led government, headed by Muhammadu Buhari, a strange and destructive scenario have been added to an already existing substandard way of organising and conducting elections in Nigeria. The President, who himself have participated and executed several coups and military take-over of power from elected civilians, have consciously applied the same attitude of forceful removal and installing of his favourite party candidates irrespective of the choice of the electorate and the general mandate/will of the people. Selection, or election so to speak, is such an aberration in Nigeria when compared to other countries that practice genuine democracy. The level of voter intimidation, rigging, snatching and stuffing of ballot boxes, manipulation of result sheets, use of armed security personnel to disfranchise voters, using the electoral umpire, the Independent National Electoral Commission (INEC) as a willing tool to falsify and manipulate the electoral process, enrollment of thugs as troubleshooters during elections etcetera, has made democracy, a mockery instrument in Nigeria. After 58 years of experimentation of democracy in Nigeria, one would have expected that electoral umpires and politicians would have mastered the art of organising and conducting free, fair and credible elections. Alas, the reverse is the case. Nigerian politicians are irredeemably corrupt and power drunk, the electoral commission is unfortunately biased, influenced and corrupt, the courts that would have stepped in to salvage the ugly situation and help clean up these widespread rots in the land, is fantastically corrupt and heavily compromised. Voters are therefore left helplessly in the hand of fate. 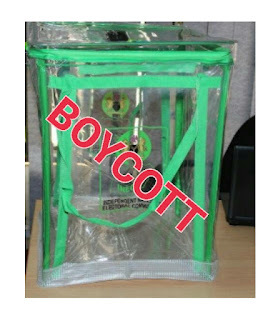 The only available option left for the electorate, whose future and that of their children, is at stake here, is nothing but total boycott of subsequent charades called elections in Nigeria. The politicians have no thoughts for you neither do they owe their allegiance to you, whether you vote for or against anybody, holds no significance in their winning or losing in an election that are usually predetermined. As long as there is a moneybag who anointed, appointed, preferred and ready to bankroll their dubious ascendancy to power, what then is the essence of lining up aged men and women, young and old in a queue under the sun and rain for hours only to discover that their popular or preferred candidate that is more qualified have been rigged out and his mandate stolen. I, therefore, support total voter apathy and boycott to this sham and very shameful exercise called selection (election) in Nigeria.